The heat is on and Sydney has just had its first heatwave of the summer. While we are still officially not even mid-way through spring, that becomes meaningless when you have a a heatwave of 35° plus temperatures and the worst October fire conditions ever. The idea of springtime and a slow build up to the extreme heat of summer is just so last century. On the food blogging front, this makes the preparing, cooking and photographing of something to post difficult: cooking after the morning cool is just impossible. As if an early heatwave wasn’t bad enough, it was also the start of daylight savings on the weekend, something which always puts me in a bad mood for a couple months, while I recover from having one hour of sleep snatched away and having to eat dinner an hour later because it is too hot to eat earlier. Seriously, the start of daylight savings always puts my body clock out of whack and makes me feel jet-lagged and lethargic. There’s something about waking up naturally at 5.30 or 6 o’clock that feels virtuous and invigorating, whereas the Sunday after daylight savings begins, I’ll look at the clock, realise it’s an hour later than usual, think ‘what’s the point of getting up anyway’, turn over, sleep some more, so when I do get up, it’s horrendously late. Anyway – that’s just my take on daylight savings and personally I wish it was just banned. My daylight savings jet-lag is the reason I’m posting this quick cucumber pickle from Marcus Samuelsson. I made these pickles last week, so photographing them only required me removing them from the fridge and taking a photo in the backyard at my leisure. Once the heat starts, everyone needs a good recipe for a quick pickle, an essential for a long hot summer of sandwiches when you can’t be bothered cooking anything at all. 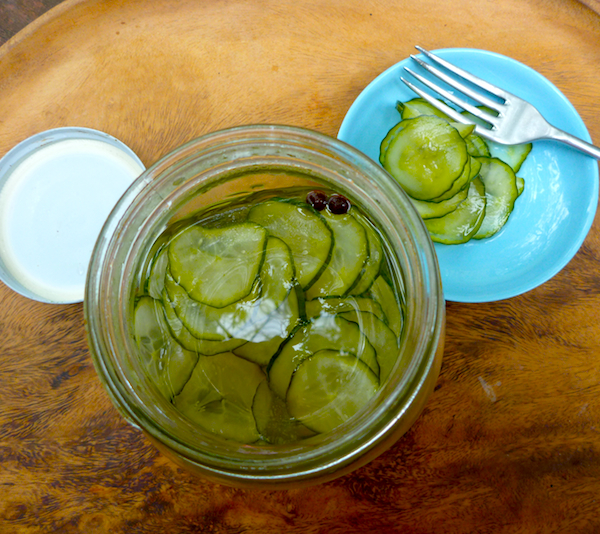 These pickles are simple and easy and delicious, and who doesn’t love a good pickle? This recipe does make quite a lot of pickle juice but over at the kitchn, they have some good ideas for using pickle juice – including using it to make more pickles, which makes your next batch of pickles something of a breeze. Slice cucumber into thin slices, use a mandoline, if you have one. Sprinkle cucumber with salt and allow to drain in a colander for half an hour. Heat water, vinegar, sugar, spice berries and bay leaf stir to dissolve sugar and bring to the boil. Remove from heat and allow to cool. Rinse cucumber and squeeze out juice with paper towels or a clean tea towel. Place cucumber in a 1 litre (1 quart) jar and pour vinegar over slices, push slices of cucumber down so they are completely covered by the vinegar mix and seal jar. Allow to sit for three hours in refrigerator before using. Pickles will keep up to two weeks in fridge. * Telegraph cucumbers are the long ridged cucumbers, often wrapped in plastic. Also known as English cucumbers. I feel cooler just looking at this! Can’t wait to try.